Columbus, Ohio (July 24, 2018)--We have been hearing reports of Japanese beetles in corn and soybean. These beetles are large with a shiny copper and green color. Foliage feeding in corn is almost never economic, though economic damage from silk clipping is possible (though rare). Consider a rescue treatment when silks are clipped to less than � inch and, fewer than 50% of the plants have been pollinated, and the beetles are still numerous and feeding in the field. 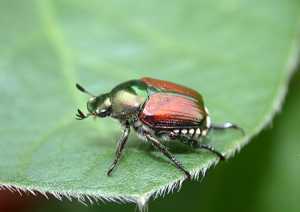 Japanese beetles will also feed on soybean foliage. While the damage might look startling, it is very rare that this reaches economic levels from Japanese beetle. A rescue treatment is advised when defoliation levels reach 30% in pre-bloom stages, and 20% in bloom to pod fill. 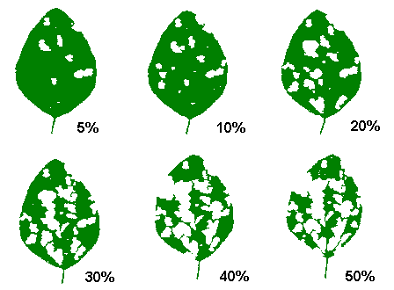 These defoliation levels apply to the plant as a whole, not just certain leaves, and can also be used for general defoliation from more than one kind of leaf-feeding insect in soybean. A visual guide to defoliation is useful because it is very easy to over-estimate defoliation in soybean. If there are other foliage-feeding insects present in soybean the same percent defoliation guidelines can be used for all of them collectively. For more information about Japanese beetle and other defoliating inseces visit our factsheet at: https://aginsects.osu.edu/sites/aginsects/files/imce/ENT_39_14.pdf.